Are you a Stephanie O’Dea fan? You know … the very adorable and very funny “crockpot lady.” For years, Stephanie hid her cute little face behind horn-rimmed glasses and her crockpot/slow cooker. She declared that she was okay with her “unnatural obsession” with her crockpot/slow cooker, the latter in which she cooked everything … and I do mean everything. You’re probably familiar with her first cookbook, the New York Times bestseller, Make It Fast, Cook It Slow, but did you know she has a new cookbook that just came out this very day? That’s right. More Make It Fast, Cook It Slow was just released. Yippee for Stephanie and for all of us! Stephanie’s new cookbook has 200 brand new recipes that are budget friendly. 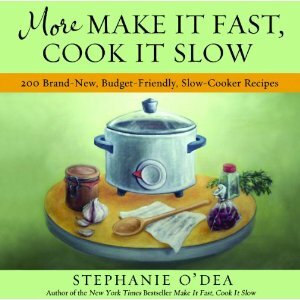 As Stephanie states on her slow cooking blog: “There are over 200 brand-new recipes in this book that have not been shared in the first Make It Fast, Cook It Slow cookbook. I have separated the book into three sections: $7 and under, $10 and under, and $15 and under dishes. Within each section, there are chapters for beverages, appetizers, soups and stews, side dishes, main courses, and desserts. The main-course selections are bountiful, because I believe this is the most beneficial.” She talks more about her book launch here on A Year of Slow Cooking and here on her Totally Together Journal blog.) In order to make and test all the recipes for her latest cookbook, she had eight slow cookers going at one time! I can just imagine Steph doing that, and oh, how I wish I lived next door to her. That would be for many reasons (I love Stephanie! ), but she and her family cannot possibly eat all the food that she makes when she’s in “cookbook mode,” so she shares with family and friends … those lucky folks! Note that Stephanie’s cookbook is written for everyone, but the recipes are also gluten free, so if a recipe is a dessert recipe and calls for flour or a baking mix, Stephanie simply notes in parentheses that she used a gluten-free flour mix, like Pamela’s. Similarly, she’ll note any other ingredients that she had to use to ensure the recipe was gluten free; e.g., a specific brand of soy sauce. I’ve shared my success with Stephanie’s recipes here at gfe before, but recently I shared the link to Steph’s Wassail recipe with Sunny (And Love It, Too) via Twitter. Sunny made it and her family loved it. So much so that her daughter insisted that some of wassail be left for Santa instead of the usual beverage. She was certain that the delicious wassail would make Santa more generous. Well, Sunny’s daughter thinks the proof is in the presents as Santa brought the whole family new bikes—seven of them! Well, Christmas has passed so there won’t be another opportunity for many days to bribe Santa, but I know we’ll all love Steph’s new book right away. Like you, I can’t wait to see it! So not only am I ordering one for myself, but I’m ordering three more for a giveaway for my beloved gfe readers as part of my 25 Days of Christmas event. See … the holidays are not completely over … you don’t have to be let down. ~ Check out Stephanie’s blog, A Year of Slow Cooking, and leave a comment telling one recipe that you’d like to make. ~ Subscribe to A Year of Slow Cooking. Leave a comment. ~ Follow @StephanieODea on Twitter. Leave a comment. Last, you can catch up with any of the other posts for the 25 Days of Christmas event here. I am already subscribed to GFE via reader. I am already subscribed to a Year of Slow Cooking via reader as well. The next recipe I would like to try from Stephanie’s blog is the Crab Dip for the super bowl game. I subscribe to gfe using Google Reader. I subscribe to A Year of Slow Cooking using Google Reader. I now follow @shirleygfe on twitter. I now follow @StephanieODea on Twitter. I subscribed via e-mail, looking forward to it! The crockpot hashbrown casserole sounds delish! I would love to wake up for a breakfast already made!! I subscribe to Year of Slow Cooking via e-mail. I got Stephanie’s other slow cooker cookbook for Christmas, and made Brown Sugar Chicken last night. The whole family enjoyed it! (I’m hoarding the leftovers for tomorrow’s lunch at work!) I can’t wait to get her next book! Thanks for the chance! I follow Shirley on Twitter, too! I love A Year of Crockpotting. It’s my go to place for recipes. I have been salivating thinking of making the cream cheese sausage and rotel appetizer again. It’s also one of the requested recipes when I go to parties. Ok, it’s not food, but she has a recipe for crockpot playdough! That’s so cool. The poundcake looks yummy too. Have GFE in my google reader! Now following Stephanie on twitter too! Added a year of slow cooking to my google reader too! I inherited my grandmothers crock pot recently and haven’t done much with it. This book sounds great! 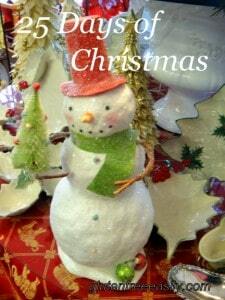 Last post, promise–I also retweeted the giveaway! I have made so many yummy recipes of Stephanie’s from her blog/first cook book. Our latest “favorites” are the pizza soup and the buffalo chicken lasagne. I “like” GFE on FB! I am already a subscriber of both GFE and A Year of Slow Cooking. I’ve made her delicious Vietnamese Chicken in my slow cooker and tons of other stuff too. I love how she weaves in gluten free so *easily* in all her recipes. Would love to win this new book and start enjoying recipes from it! I’ve been trying a lot of Stephanie’s recipes lately, but one I’m anxious to try is Marmalade Curry Chicken! I already suscribe/follow the GFE blog. I would love to make Stephanie’s crockpot fish chowder recipe, although I will have to find some tweaks to replace the heavy cream (no dairy) and the shrimp (I may love the stuff, but one of my boys goes anaphylactic with shellfish, fish is okay, just not shellfish)…otherwise, it is a good foundation for something I really want to try! I already “like” gfe on FB, and follow both Shirleygfe and StephanieODea on twitter (of course, given that you mention me directly on this post, I suppose you knew that already ;)). I purchased Make It Fast, Cook It Slow shortly after it was first published, even before my blogging adventures began…I cannot wait to get my hands on this second edition! Great giveaway Shirley. I already subscribe/follow A Year of Slow Cooking blog. I just “liked” GFE on Facebook. I already subscribe to Stephanie’s blog. Ever since I got the first cookbook, I have been making various slow cooker meat dishes for frequent pot luck dinners at my son’s school. We’ve had a lot of luck with the barbecue ribs, and the roast beef. One of the high school students also eats GF, and when she sees me coming in with the crock pot she runs up and asks, “did you make it gluten free?? *squeal* ” It’s so hard for us to find something we can eat at these pot luck dinners, but Stephanie’s recipes make it so easy to bring something we can eat. I already Like gfe on Facebook, and I posted whine-filled comments about what my extended family tried to feed me at Christmas dinner. i’ve subscribed and love your site. thanks! i liked gfe on fb! Chocolate Pudding Cake is the one I want to try. Already have it in the queue. Just found your website, would love to get a copy of Stephanies new book. Thanks for the chance! Would love to have this book! Thanks for the review. . . I already subscribe to A Year of Slow Cooking. when I started reading A Year of Slow Cooking I think I had 2 crockpots. I am now up six ( of various sizes. I also have the 3 crockpot servette. Use that a lot for pot lucks and family parties. Do want the new book….DO NEED THE NEW BOOK…. I LOVE her site and have many of her recipes on my blog as well! She rocks! I am a subscriber of her blog! Thanks! I already subscribe to the Year of Slow Cooking blog, and Stephanie’s Totally Together Journal. I would LOVE a copy of her new cookbook. I asked for it for Christmas, but because Mom was a bit confused, now have two copies of her first book. I was going to try to exchange it, but if I can win the new one, then I will donate the second copy of the book I already have. i subscribe to her blog via email. i make the apple butter recipe all the time and the chocolate pots de creme with ganache was my holiday go to recipe. yummy! I subscribe to A Year of Slow Cooking via email. I love her book and blog. I asked my library to order a copy of the book (the first one) and I bought one. I’ve tried the Cowboy Stew, the Chicken Cordon Bleu, the Winner Turkey Dinner, the Beef and Broccoli and more and all are, without exception, tasty and 5 thumbs up at our house. I already read Stephanie’s blog(s) daily, and my favorite recipe is the pesto chicken with sweet potatoes that you cook right on top of the chicken. A quick, healthy, inexpensive meal that my family loves! I already follow Stephanie on twitter. I’ve tried several of Stephanie’s recipes with fantastic results, and another one I’m looking forward to trying soon is her Slow Cooker Chocolate Pot de Creme. Sounds delish! I subscribe to gfe via email. Thanks! I just subscribed to A Year of Slow Cooking via email. I’d like to try a dessert — the blueberry coffee cake looks good!! I would love to try Stephanie’s Peanut Butter Cup Cake! Sounds yum-o! I am also an email subscriber to GFE. Her CrockPot Pasta Fagioli Recipe is wonderful – I’m a long-time reader over there…. I am also an email subscriber to A Year of Slow Cooking. ~ Following @StephanieODea on Twitter. I’m already a subscriber to GFE and A Year of Slow Cooking as a reader. Great to find GF recipes from both GFE and Stephanie’s a Year of Slow Cooking. Would love to have a copy of her book More Make it Slow Cook it Fast for I have four crockpots. I had it on my Christmas list but didn’t get one. I am a facebook gfe follower! I am an email subscriber to A Year Of Slow-Cooking. I would like to try the crockpot pizza!! I already subscribe to gfe! I checked out stephanie’s blog. I’d like to try the turkey and wild rice soup. yum! I went to Stephanies site and found the African peanut soup. That sounds so good I will have to try that soon. I subscribe to a year of slow cooking. I subscribe to A Year of Slow Cooking by email. In fact I’ve subscribed since 2008. I just got a slow cooker for Christmas, and I can’t wait to try to make my own yogurt! I need to try the odor neutralizer recipe. My house has been closed up for way too long! I follow Steph on Twitter. I am a Year of Slow Cooking subscriber. And! I liked on facebook! the coconut chicken curry sounds delicious! I already subscribe to A Year of Slow Cooking on google reader. I am also now following Shirleygfe on twitter! There are about a gazillion recipes on Stephanie’s website that I’d like to make, but first on my list is the peanut butter chocolate pudding pie! I love all her recipes because they are naturally gluten free! I want to make a different variation of her chicken enchilada chili. I love it but want to add more of a smokey/roasted taste. I follow GFE via email. I’d also like to mention that I’ve seen Stephanie’s first book at one of the local bookstores around here but I’ve yet to pick it up and read it! I know, terrible. But I have been to her blog many times and always leave feeling inspired and am always amazed at the number of things one can use their slow cooker for beyond the usual standards. I think Stephanie raised the bar in that department. Congrats on the 9,999 blog comments Shirley! Carolyn–I can always count on you to respond to my FB entries. 😉 Your comment is number 10,000–woohoo! Just for that, I’m sending you a copy of Steph O’Dea’s new cookbook, too, when I send out the others to the winners! Congrats! I’ve been following Stephanie for a few years now both on TTJ and YoC. Her recipes are outstanding and her personality is so engaging. I would love to win this book. 🙂 I need to try some of her Indian recipes. That’s a cuisine I’m not really familiar with. I love Stephanie’s blog! She has great (easy) recipes. Just like you Shirley! I LOVE her first cookbook, I’ve made many recipes and have been using her crockpot method to make Coconut Yogurt for my son who is gluten, dairy and soy free. I have not heard of these cookbooks, but can’t wait to get my hands on a copy. I have 4 crock pots and love to use them all!!! Wow! You do have a lot of responses! Such fun! Subscribed to year in slow cooking via email. Can’t wait to try the salsa chicken recipe. Made one of Stephanie’s recipes last week for her pomegranate beef pot roast. Absolutely amazing! Can’t wait to try more of her wonderful recipes! already subscribe to GFE by email! and love it! I am going to make the Hashbrown Breakfast Casserole for my family on New Years Day. I ‘like’ GFE on Facebook. I subscribe to A Year Of Slow Cooking also! Already “like” GFE on Facebook, so I “liked” A Year of Slow Cooking as well. Also subscribed to Stephanie’s blog – looking forward to it, because I love the first cookbook and the practicality of her recipes. I like GFE on facebook- please enter me in the cookbook giveaway!!! I still keep meaning to make her Turtle pudding/cake. I need to find an occasion, so I don’t eat it all myself! I also subscribe to Stephanie’s blog. Looks like a fabulous book! My main question before I entered was if this book was one that used “cream of” soups and I was so happy to read that she does not use them at all! I have been playing around all day and tomorrow we are making her slow cooker beef bourguignon! Looks fab! I am an email subscriber of GFE. I “like” GFE on Facebook! I subscribed to Stephanie’s blog! A recipe I would like to make is the Chocolate Almond Tapioca Pudding. It looks awesome. I Like gfe on Facebook as Susan Clarke Taylor. Yum the pulled pork with sauerkraut looks yummy! Liked GFE on facebook quite some time back! Love keeping up on posts! Just subscribed to Stephanie’s blog! YAy! I subscribe and I’d love to win her cookbook! I’ve already made several of the recipes from A Year of Slow Cooking including the Korean Ribs which were fantastic. I also plan to try Vietnamese Pho Soup. I would like to make Slow Cooker Pork and Sauerkraut! I subscribe to A Year of Slowcooking via email. Wow! I can’t believe I won! Thank you gfe 🙂 I did make Stephanie’s Pork and Sauerkraut and it was delicious!! Happy New Year! Congrats to the other winners. I’m so happy to win this one. I know I have some great cooking to look forward to with this one and can’t wait to get it and start cooking. Excited to win a copy of this book – can’t wait to get it and make some yummy recipes! I like GFE on facebook, and I would like to make Turkey Stew. I subscribed by email to A Year of Slow Cooking. I would like to make Turkey Stew. I subscribed to GFE by email. I checked out Stephanie’s blog. I would like to make Turkey Stew. And thanks for the giveaway!